» So just what’s going on here? So just what’s going on here? 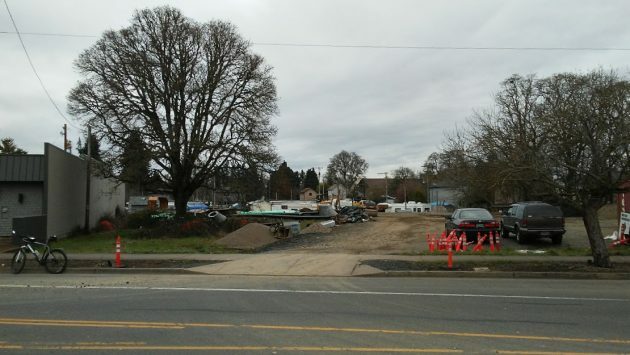 To at least one reader, it looked as though Emery & Sons was building some kind of infrastructure on a big vacant lot off Albany’s Santiam Road, just east of the Carriage House Plaza and north of the tracks. When she asked me what was being built there, I first went by the place to take a look and then, finding no one on the site to ask, to City Hall. Turns out that Emery, the Salem-based construction company that has done several major Albany projects, is using the Santiam Road site as a staging area for working on its current contract. Last May, Emery was the low bidder (out of three) for a $1.4 million project to replace more than a mile of sewer pipe in nearly two dozen locations throughout the older sections of Albany, from the Broadway Neighborhood in the west to the Willamette Neighborhood in the east. The company is using a trenchless method known as pipe bursting. As the term implies, the process breaks apart the old pipe while pulling a new section through the broken old one. In this way, the crew is replacing 5,100 feet of 8-inch sewer mains and another 1,450 feet of 10-inch mains. In Public Works, the engineer in charge of managing the project is Lori Schumacher. She told me the project started last fall and is likely to be completed by the spring. Until the moment I read about it on Hasso Hering’s column I’d not heard of pipe bursting methods wherein the technique “breaks apart old pipe, pulling a new section through the broken old one.” Admittedly admirable. It does beg the question. Each time the pipe-bursting technique is employed, musn’t the new pipe being pulled thru the old pipe be of a smaller diameter in order to perform as described? If the technique is used repeatedly over a pipe’s worth of history, is there not some point where the pipe diameter becomes too narrow to perform it’s intended function? Actually the technique allows for pipes to be replaced with larger ones. Given that, it seems that at some point in the future we ought to be able to flush nearly anything down the loo. Please don’t hold on to that thought. This type of work is typically done to increase volumetric capacity and to reduce leakage. The biological treatment process won’t really change. Just ’cause something can go down the drain doesn’t mean it should. Climbing down from the soapbox now. Like Always I get great new stories by Hasso! Keep it up Mr. Albany, you truly are a great service to Albany!